Eewww... That's a bloody knife. Sound is another area where Soldier of Fortune excells. The backing music suits the fast-paced mood of the action perfectly, and the standard first-person shooter explosions, gunshots and screams of agony blend in with this to create an atmosphere of mayhem... but, fun mayhem. 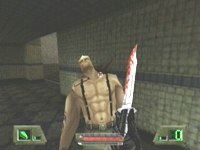 If you've already invested in a mouse and keyboard for your Dreamcast, (which you should have if you're a respectable FPS player) then you'll be able to play Soldier of Fortune the way it was meant to be played. Both keyboard and mouse are easily configurable and work perfectly with Soldier of Fortune. If you haven't dropped the cash on said peripherals just yet, the game can be played adequately with the standard Dreamcast controller. There are several controller configurations available and gamers should have no trouble finding one which suits them. Some of the levels are really beautiful, like this one, for example. No game is perfect... and even Soldier of Fortune has its shortcomings. Firstly, there are some minor flaws that can be noticed in the game's graphics. Some things in the game just look too box-like. The Soldier of Fortune vehicles aren't quite just a "box with four wheels", but they're worryingly close. This could be due to the Dreamcast's lack of power compared to that of the average gaming PC. "AAAAAAARGH!! LOAD, DAMN YOU! STUPID GAME!!". That's what the slightly inpatient gamer might find themselves yelling at their TV screen while waiting for the average Soldier of Fortune level to load. Yes, the load times in Soldier of Fortune are a tad bit long. In a way, given the game's graphics and sound, its not surprising that load times are so lethargic. But, if Unreal Tournament's load times frustrated you, then don't even attempt to sit through Soldier of Fortune or you might quite literally explode. In my opinion though, the length of the load times is more than made up for by the fast pace of the ingame action. While Soldier of Fortune's mouse and keyboard configuration is more or less flawless, you might find yourself baffled by the Dreamcast pad's configuration at first. While configuring the controller is simple, there are just too many commands to worry about, and not enough time to think about what button to press. Executing complex manuevers can be a pain with the gamepad. With a game as fast-paced as Soldier of Fortune, theres little time to stop and think about which button does what. As stated before, to get the full Soldier of Fortune experience, you're going to want a mouse and keyboard to play it with. Sadly, Soldier of Fortune's (AI) artificial intelligence would be more accurately described as artificial stupidity. Sometimes battles consist of "stand, shoot, dodge, die or don't die", but sometimes enemies don't even see the need to dodge. This gap in Soldier of Fortune's difficulty is made up for by the sheer number of enemies that you'll find atacking you, as well as the power of their weaponary. Dumb or not, these guys are armed to the teeth, and you'd be stupid to underestimate some of the game's later enemies. Overall, Soldier of Fortune provides the same old first-person shooter action, but in a slightly different format. Sure, the gore alone will keep you entertained at first, but once you discover the game's detailed graphics and subtle effects you'll be hooked. Let down by only a few niggling flaws, Soldier of Fortune is a game that first-person shooter fanatics will love. Lows: Visuals sometimes blocky, Long load times, Poor AI.